I like to watch daily deal sites for deals. My strategy is to look for deals on places we already go. For instance, we have a favorite sushi restaurant that offered a deal on Double Take Deals–pay $15 and get $30 off your order. We were allowed to buy a maximum of 5 certificates, which we bought. They are good for a year. Having those certificates helped us afford to take my son out there to celebrate his First Communion and to take the family out for my birthday. However, I am not organized. I subscribe to so many different deal sites spread across so many different e-mail addresses that I can’t keep track. In fact, I missed another Double Take Deals for the same sushi restaurant. Too bad because we are down to just two vouchers left. If you like to take advantage of deal sites but don’t like your inbox to be cluttered, you may want to consider joining Deals for Mommy. 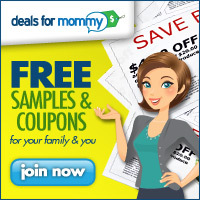 This site finds the best deals for moms and families from daily deal sites and puts them all in one place. I recently joined, and see local deals from Groupon, Restaurant.com and Coupons.com, to name just a few.